A stroke, or brain attack, occurs when the blood supply to a portion of the brain is suddenly interrupted. Signs of a stroke can vary depending on where the damage is located. The signs tend to show up suddenly. Stroke is a life-threatening condition that is most common in people aged over 60, but can occur at any time in life. Stroke is the second most common cause of death and the first leading cause of disability in developed and developing countries. Can you recognize the signs and symptoms displayed by the person who is suffering from stroke? If NOT then why not join one of our upcoming courses and learn first aid for routine injuries and illness. 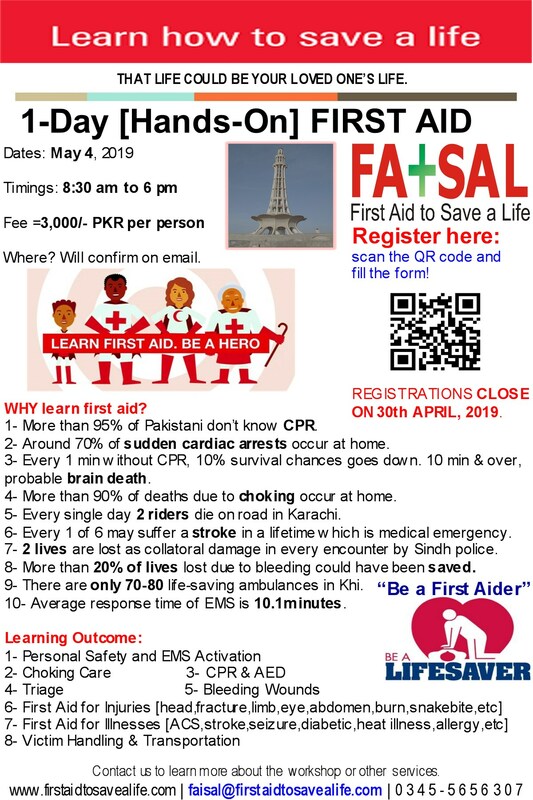 This entry was posted in First Aid CPR and AED and tagged 1st aid, CPR and AED Training, cpr training, emergency first aid, emergency first aid at work, family first aid, first aid, first aid at work, first aid for home, first aid for stroke, first aid training in islamabad, first aid training in karachi, first aid training in lahore, islamabad, Karachi, Lahore, Signs of stroke, stroke first aid, types of stroke, What is FAST, what is stroke, why learn first aid. Bookmark the permalink.